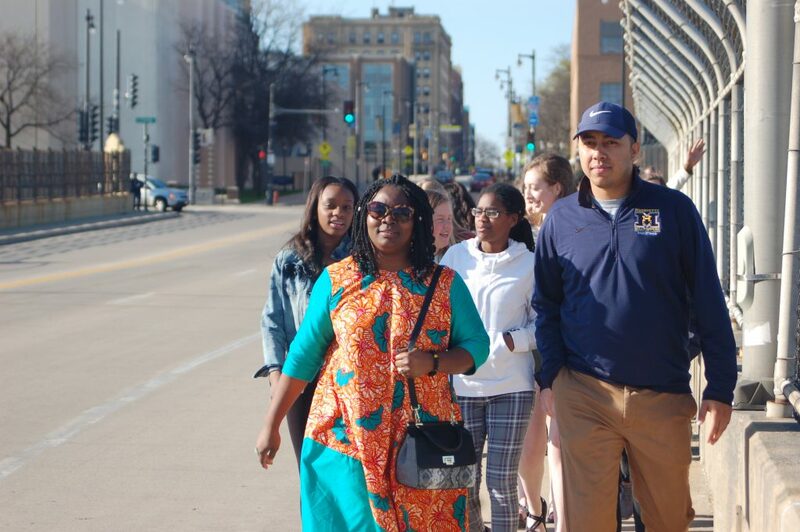 Students and staff from three high schools gathered at the Alumni Memorial Union on Marquette’s campus and walked across the 16th Street viaduct. Photo by Rachel Kubik. Laura Hancock, campus minister at Messmer High School, said she and Lisa Metz, a theology teacher at Divine Savior Holy Angels High School, discussed the racial climate in the U.S. with another friend more than two years ago. Hancock said it was really disheartening. “We kind of just started dreaming, wouldn’t it be awesome if our three schools could go on a civil rights pilgrimage together? And it really just started there as a dream, as an idea, and over time it has become a reality,” Hancock said. Jaylin Taylor (left) and Maya Garrett (right), two seniors from Messmer High School, march over the 16th street bridge. Photo by Rachel Kubik. 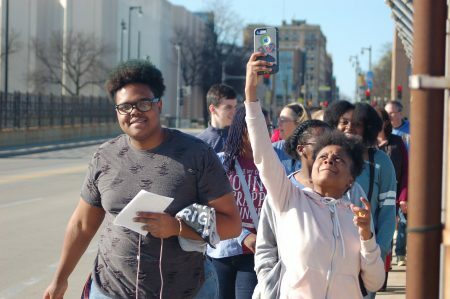 Students from Messmer High School, Marquette University High School and Divine Savior Holy Angels High School walked across the 16th Street bridge, also known as the 16th Street viaduct, to follow in the footsteps of the Milwaukee open housing marchers in 1967. The viaduct connects Milwaukee’s North Side and South Side neighborhoods. The march was the first event of many that this group of students will embark on. Starting May 30, students will travel to Memphis, Selma, Montgomery, Birmingham and St. Louis to see sites important to the civil rights movement, such as the National Civil Rights Museum in Memphis and the National Memorial for Peace and Justice in Montgomery, Alabama. Metz said the historical sites also are relevant to the present day. For example, St. Louis — near where Michael Brown was killed in 2014 — is important to the Black Lives Matter movement. “We’re really trying to be full circle with the past but really actively present,” Metz said. Reggie Jackson, speaker and head griot at the America’s Black Holocaust Museum, spoke to the students before the march about the history of the protests and his interactions with marchers. He advised students to make personal relationships with people of different backgrounds so they don’t judge people based on stereotypes. Derek Keller, a student at Marquette University High School, said he thinks most people dismiss racism because they think it’s all in the past. However, he noted that racism is still present in Milwaukee, and he was motivated to go on the pilgrimage to learn about how to see others’ differences and interact with people more meaningfully. “It’s really an honor to be able to do this, experience all these new places and bring that back to Milwaukee,” said Keller. He said the most surprising aspect of Jackson’s speech was learning that most of the marchers were teenagers, because he initially thought they were older. He said it was a big deal to him because that’s his own age. “If they can be a part of this, then maybe even I can make a difference,” Keller said. Mamaa Yorke, a student at Divine Savior Holy Angels High School, said her family wasn’t from the United States and family members didn’t get a firsthand account of what happened in the 1960s. She went on the march to see for herself. Yorke said she stands up for what she believes in. “I feel like I am very strong in my opinions and I won’t let other people change my opinions just because.” She said she thinks the student march across the bridge will have a small ripple effect in a big ocean.